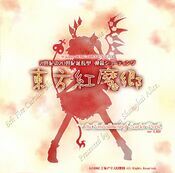 Remilia Scarlet (レミリア・スカーレット, Remiria Sukāretto) is the main antagonist of Embodiment of Scarlet Devil. She's a vampire and the owner and head of the Scarlet Devil Mansion, the mistress of Sakuya Izayoi, Hong Meiling and the fairy maids. She's also the older sister (and guardian) of Flandre Scarlet. 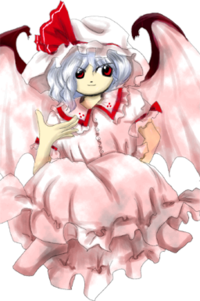 2.1 Remilia and "The Vampire Incident"
Remilia first appeared as the Final Boss in Embodiment of Scarlet Devil. 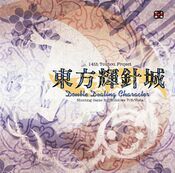 She later became a playable character in Immaterial and Missing Power, Imperishable Night (along with Sakuya as a duo) and Scarlet Weather Rhapsody. She was also a Stage 7 target in Shoot the Bullet and a Final Day boss in Impossible Spell Card, along with been in the background of Hopeless Masquerade. Due to being a vampire, she usually appears at night, indoors or under a parasol when the sun is out. She is seldom seen without a parasol on a sunny day outdoors. While her appearance (and often speech and behavior) may portray her as childlike and non-threatening, she has fearsome magical powers and a reputation to match. Like all vampires, she evaporates when exposed to sunlight (although Hieda no Akyuu mentioned that she can reabsorb the lost residue). Thus, she typically remains inside the Scarlet Devil Mansion (which has few windows to prevent light getting in) during the day and emerges during the night. While she is naturally known to drink human blood, especially favors B-type blood, her light appetite means her victims rarely die from their wounds. However, since she tends to stain her clothes a deep scarlet from the blood, she is also known to be called the Scarlet Devil (紅い悪魔, Akai akuma). While she tries to cultivate the image of a mysterious and frightening vampire aristocrat, Remilia is as childish as her appearance suggests. However, she is surprisingly polite. Her long lifetime has only served to make her prone to boredom and as a result she prizes anything she finds novel. In Silent Sinner in Blue she allows herself to be manipulated by Yukari Yakumo, simply because the alternative would have been boring. The other residents of the Scarlet Devil Mansion spend much of their time catering to Remilia's odd whims (including numerous parties), though she does make an effort to appreciate and respect their patience. 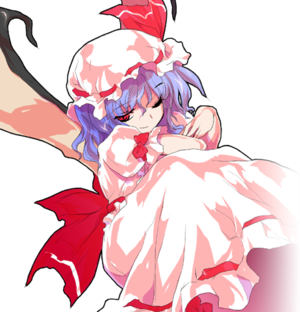 Remilia is respected by most youkai of Gensokyo and so she's said to have a charismatic personality. However, in reality this is only because of the fear they have for her kind. While she can act in an overblown and grandiose fashion, she usually only does it during incidents or for important matters. Otherwise, she tends to exhibit childish behaviour. She enjoys novel things and isn't above playing along in silly games or allowing herself to be manipulated if it means staving off boredom. Her behaviour may be due to the fact she actually has the wisdom of a 500 year old being with the personality of a bratty child. Yet, it remains to be said that she has an overflowing and charming personality that even makes most fairies stick around as employees despite their freedom to leave at any time. Remilia in red magic, as illustrated in The Grimoire of Marisa. 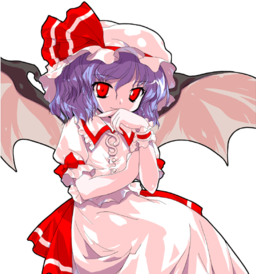 As a vampire, Remilia has tremendous physical abilities (superhuman strength and speed) and magical power. According to Perfect Memento in Strict Sense, vampires have the strength of oni and the speed of tengu, that allow them to uproot a thousand-year-old tree single-handedly and to run through the Human Village in a flash. While the true extent of these capabilities is unknown, Remilia's profile in Immaterial and Missing Power describes her as being "faster than the eye can follow, and strong enough to crush boulders", and in Silent Sinner in Blue she claimed that she was able to fly around the Moon (or at least around its "fantastic" version) in an extremely short period of time. Vampires also have the ability to summon and manipulate a great number of devils with a single shout, and to turn into a swarm of bats or even mist to escape or dodge an attack. Additionally, as long as their head remains intact they can regrow the entire body in just one night. Because vampires possess all of these capabilities, they are among one of the strongest species in Gensokyo. Like most vampires, Remilia has the power of shape-shifting at her disposal and can change into a bat. However, unlike most vampires, her wings remain visible even when she is in human form, making it impossible to pass herself off completely as a human. Because she has the ability to summon and manipulate devils, it would be natural for her employing them in great numbers. However, the Scarlet Devil Mansion currently only has one little devil, usually seen around the library of the mansion, in employment. It remains a mystery as to why so many fairy maids are employed instead. Vampires like Remilia are also agelessly immortal, as they forfeit growth and maturity in exchange for eternal life. In the current world view of Gensokyo, there isn't detailed information concerning this ability nor an instance where Remilia clearly used it. Thus, what this ability actually entails is quite uncertain. If the power is as potent as it suggests, then for any enemies that she confronts, she should be able to change fate to her advantage so that she would always win. However, since Remilia does sometimes lose, this does not seem to be the case. This could just because of the spell card rules however, similar to how Reimu Hakurei is not allowed to easily win any battle by using her ability to float out of reality (before Marisa Kirisame came out with Fantasy Nature, which has a time limit and thus is not completely unbeatable). It is unclear whether Remilia manipulates it intentionally or if she can only change the fate of things around her without being aware of doing so. Thus, there exist speculation as to whether she truly can use it. The best representation of this ability would be in several of her spell cards where she uses red chains that chase the enemy (chains are commonly associated with destiny). According to Hieda no Akyuu in Perfect Memento in Strict Sense, it seems to be that those in her vicinity will be followed by bad fortune. This may be a "use" of her ability similar to Hina Kagiyama's ability to spread curses and misfortune by merely being close to someone. However, this is not an effect that can be quantified. Akyuu also states that Remilia can bring great changes in one's daily life with nothing more than a word but as mentioned before, it is still something that can't be measurable. As such, no one can know when or if she's actually doing it. In Bohemian Archive in Japanese Red, according to her little sister Flandre Scarlet, the true nature of the ability may simply be to know what happens in the future. However, Flandre also said that it's just that "she [Remilia] just likes to talk that way" and thus may just be an act of pretence. 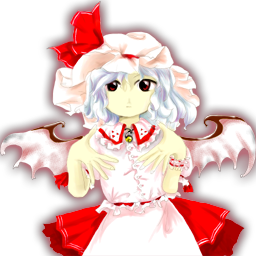 Remilia's past prior to her arrival at Gensokyo is unclear, but her name, appearance, house, and clothing imply she is European in origin, and she has been stated to have come from "the west". She has been the mistress of the Scarlet Devil Mansion for about 500 years. She claims to be a descendant of one of the world's most notorious vampire: Count Vlad Ţepeş Dracul. However, unknown to the people of Gensokyo, this is a complete lie. Remilia and "The Vampire Incident"
It is not known how Remilia came to Gensokyo in the first place, but the Scarlet Devil Mansion (and thus presumably Remilia herself) were in Gensokyo at least as early as 1998. It is also known that when she came to Gensokyo, the Great Hakurei Barrier (erected in 1885) had been in place for a while, as at this point in Gensokyo's history, the youkai had lost much of their power from being unable to attack humans. Upon arriving in Gensokyo, Remilia quickly gathered many subordinates and proceeded to go on a rampage. However, she was eventually defeated by powerful youkai. They settled on a devil's contract where the youkai would give her humans for food, and in exchange she would not attack the humans of Gensokyo. Such prohibition proved distasteful to many youkai, which led to talks with Reimu Hakurei to establish a set of ground rules for battle (It is unclear if Remilia was involved in these discussions). 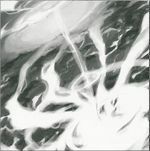 This culminated in the creation of the spell card rules. 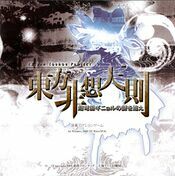 In 2003, almost immediately afterwards, another plot of Remilia's would lead to the first incident that used the system. Remilia in Perfect Memento in Strict Sense. Her full name is Remilia Scarlet (レミリア・スカーレット) that, unlike most Touhou Project characters, gives strong western feeling, likely French or British. The name "Remilia" is likely made-up by ZUN, in which is a variant of "Emilia", which means "Rival; Emulating". "Scarlet" refers to a bright shade of the color red with a slight hint of orange and is a variant of "Scarlett" as a surname. The middle dot (・) in the middle of her name is used in foreign names to show where the next word begins. Despite having a name, she is more commonly known as "the vampire", "the Scarlet Devil" (紅い悪魔) and sometimes "the mistress". It's actually quite uncommon for other residents of Gensokyo to refer to her proper name. However, Patchouli calls her Remi (レミィ). In Embodiment of Scarlet Devil, Immaterial and Missing Power and Scarlet Weather Rhapsody's official art, Remilia has red eyes, short light-blue hair and a light-pink mob cap with a red ribbon decorated with white stripes. She wears a light-pink dress with a red ribbon on both sleeves (is seen with red trimmings in Embodiment of Scarlet Devil), a large red ribbon behind her waist with white stripes and a necklace featuring a Caduceus-like centerpiece. She also has a pair of large black bat-like wings on her back with a wingspan wider than her height. In Imperishable Night, she is seen without the necklace. Her height is "short" and is of a child not having reached the age of 10. Her alternate outfit in a palette from Immaterial and Missing Power and Scarlet Weather Rhapsody has her dress red instead of pink and her hair blond. This color scheme looks similar to her sister's, Flandre Scarlet. The Scarlet Mist Incident, as illustrated in Bohemian Archive in Japanese Red. Remilia in Bohemian Archive in Japanese Red. In Embodiment of Scarlet Devil, Remilia decided to release a mist over Gensokyo to block out the sun and let her move freely during the day; after her scheme was discovered and halted, she was forced to use a parasol to shade herself when she wanted to move around during daylight hours (as mentioned in Immaterial and Missing Power). A speculation from Hieda no Akyuu, however, is that Remilia actually staged the entire incident and lost on purpose in order to show Sakuya Izayoi, who was having trouble adapting to Gensokyo's environment (possibly culture, given the context), that humans could be friends. There is nothing to prove this to be true, but nothing to really disprove it, either. Remilia does take her loss with amazing stride in every single ending, where the only hint of anger she shows about losing was jokingly ribbing Marisa Kirisame that things would have been cooler with the mist, though in the Marisa B ending Sakuya does hide Marisa in the library so Remilia can't find her. In the Reimu A ending, Remilia comes to the shrine with a parasol of her own volition and doesn't seem annoyed at having to use a parasol, causing Reimu to ask why she bothered with the mist in the first place. Unfortunately, Reimu starts playfully(?) grappling Remilia before Remilia can answer. In Imperishable Night she heads out with Sakuya to punish the ones who took the full moon from the night sky since the fighting would be at night. Due to her weakness to sunlight, it's only possible to play as her on night stages. During her story mode, Remilia leaves the Scarlet Devil Mansion after convincing Sakuya that she should handle it herself. After running into Marisa Kirisame and beating her up, she claims that she will be the "star" of the upcoming feast. She goes to the Hakurei Shrine afterwards and defeats Reimu, repeating her intentions. She then defeats both Youmu Konpaku and Yuyuko Saigyouji. Finally she meets Yukari Yakumo, and demands to know who is behind the feasts happening every night. In the end Suika Ibuki appears and the vampire defeats her as well. During her ending, she tries to enjoy a full moon with Sakuya and they discuss what it means to have class. In Shoot the Bullet, Aya Shameimaru encountered Remilia on stage 7 and took photos of her danmaku. 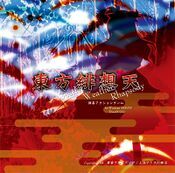 In Scarlet Weather Rhapsody, she settles her "own" investigation by ordering Sakuya Izayoi to drag the suspects to her, in order to find the culprit, figuring later that the culprit is above the mountains, where she is very prone to the light. If connecting SWR with Touhou Hisoutensoku, then Remilia can become a selectable character to play with, although she appears in no scenarios. If the player places a custom parasol system card in Remilia's deck, she'll be able to fight in stages that has sunlight, although she isn't shown with a parasol on-screen. 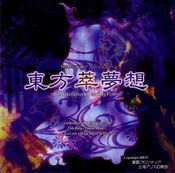 Remilia appears as a background cameo in Hopeless Masquerade on the Hakurei Shrine stage. She is sitting on a chair with Patchouli Knowledge and Sakuya Izayoi drinking some tea. She has a Fairy Maid holding a parasol to block sunlight from her. After apparently reading the newspaper by the tengu about a mischief-making amanojaku, she becomes one of the many strong youkai and humans to try and stop Seija Kijin on the final day. She uses spell cards that are considered impossible to dodge. Aya Shameimaru writes an article about the scarlet mist that Remilia used to cause the Scarlet Mist Incident, describing the weird red rainbow it creates and it's wing-like pattern (more specifically, angel wings, that would clash with Remilia's position as a Devil). However, when interviewed, Remilia only explains the cause of the rainbow, saying that she doesn't know anything about the pattern and thus it had no real meaning. Patchouli Knowledge intervenes and after giving a more complete explanation about the scarlet rainbow, explains that the pattern is only a coincidence and it happened because Remilia releases the mist from her fingers, making it following the shape of the fingers themselves. Aya interviews Remilia, along with her sister, to get some informations about the meteorite that exploded in the sky. While Flandre just describes how she destroyed the thing, Remilia explains that the meteorite was fated to fall on her mansion right in the moment it happened, and that Flandre was also fated to be there destroying it. 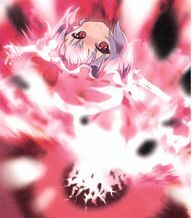 In a successive interview, Remilia re-explains that it not only was fated to fall there, but also that the event was caused artificially and that someone forced it to do so, showing a fragment of the meteorite covered by magical runes. With the help of Patchouli, Remilia is able to travel to the Moon together with Reimu, Sakuya and Marisa, using the Moon Rocket that uses Reimu's power. There they meet Watatsuki no Yorihime with various Moon rabbits and pick a fight with them, but since both sides don't want to create a bloodshed, they fight using the spell card rules. After Yorihime defeats all of them, Remilia and the others (except Reimu) return to Earth. Despite suffering a crushing defeat from the Moon Princess, Remilia doesn't seem to be really bothered by it, and finds another way to pass time and amuse herself by building a fake indoor sea in the Scarlet Devil Mansion. In Chapter 6 of Forbidden Scrollery, Remilia tells Reimu that she has found a rare animal from the outside world, a tupai, and is currently raising it. However, it goes missing, and it's assumed that it's behind the sake disappearances in the Human Village. In Chapter 7 this "tupai" is revealed to be a chupacabra named Tupai. Remilia and Flandre, as illustrated in Bohemian Archive in Japanese Red. Flandre Scarlet is Remilia's younger sister. Flandre is stated to respect her sister, and Remilia cares for Flandre as shown where she is considering getting her a good tutor in Imperishable Night, but it is unknown how often the two interact. Perfect Memento in Strict Sense states that it's rare (but not nonexistent) to see Flandre and Remilia together. The only time in an official work that they are depicted together is in Bohemian Archive in Japanese Red, which also shows that Remilia will at least allow Aya to interview Flandre in the first place. The interview shows that although Flandre might respect her older sister, it's to the extent you'd expect a snarky child to. She is willing to outright state when she thinks Remilia is just spouting nonsense, at which point Remilia comes in with a comment that she shouldn't be talking about her older sister like that. Sakuya Izayoi serves Remilia Scarlet as the Head Maid without question, a servitude with which no one knows why either trusts each other so much (Perfect Memento in Strict Sense gives the most popular theory). She is often assigned to run errands relating to the current incidents, as Remilia cannot go outside without an umbrella. Sakuya follows Remilia's requests even when she knows it won't work, such as catching Lily White to catch Spring in Strange and Bright Nature Deity, because that's what her mistress wants. When Remilia playfully criticizes Sakuya for her failure to catch spring, she takes it in good stride and doesn't disagree. They are shown to be close friends, as Remilia forgives Sakuya even though she is not always competent in keeping away unwanted visitors, seen through her defeat by two humans in Embodiment of Scarlet Devil. She will also do things for Remilia if Remilia doesn't even ask, like accompanying her in Imperishable Night and Immaterial and Missing Power. As stated in her profile, occasionally she's more a babysitter than a maid. She chastises Remilia in her Scarlet Weather Rhapsody and Immaterial and Missing Power victory quotes for sneaking out food or playing around too much. Patchouli Knowledge is Remilia's friend. In Perfect Cherry Blossom ending, Remilia called Patchouli Pache (パチェ). The two have been depicted having tea and casual conversation together in Silent Sinner in Blue and Oriental Sacred Place, where Patchouli offhandedly commented that they're both creatures of the night. As stated in Perfect Memento in Strict Sense, Patchouli's role at the mansion is to solve problems (and to cause them), although it is uncertain if that means she's officially an employee or not. Regardless, Patchouli will often volunteer her services when she sees Remilia in need of them (such as causing a rainstorm to keep Flandre Scarlet confined to the Scarlet Devil Mansion when Flandre was trying to get out in Embodiment of Scarlet Devil). It is unknown how Patchouli came to live at the Scarlet Devil Mansion, but she has been there for about one hundred years. Hong Meiling is the gateguard of the Scarlet Devil Mansion, and thus an employee of Remilia's. 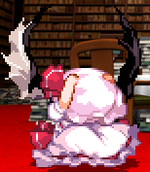 Meiling serves her mistress faithfully and loyally (but not necessarily competently all the time), apologizing to her not-present mistress when she fails to defeat Reimu Hakurei or Marisa Kirisame in Embodiment of Scarlet Devil. The only known depiction of an actual interaction between Meiling and Remilia in an official work is their win quotes to each other in Immaterial and Missing Power as well as Touhou Hisoutensoku, which depicts their interactions as a generally friendly one. Other interactions are stated in other works, however. Bohemian Archive in Japanese Red shows that Remilia likes to play pranks on Meiling quite often (the latest in the article being an order for Meiling to restore the garden to normal despite how Remilia knew it was beyond Meiling's ability to do so). Perfect Memento in Strict Sense also mentions that Remilia enjoys watching Meiling's duels with challengers at the gate. It is unknown how Meiling came to be under Remilia's employ or who hired her (an advertisement in Bohemian Archive in Japanese Red shows that Sakuya Izayoi is the one currently in charge of hiring at the Scarlet Devil Mansion, but that doesn't mean she was the one that hired Meiling). Remilia mesmerising the Tupai with Flandre Forbidden Scrollery Chapter 7. Similar to Meiling, the Fairy Maids must put up with Remilia's outrageous requests from time to time, as stated in Perfect Memento in Strict Sense, and Remilia gets frustrated with her fairies in Silent Sinner in Blue when they turn out to be quite useless during their battle against Watatsuki no Yorihime and her rabbits. Punishments, however, are never mentioned or depicted, with Remilia only going so far as to make an angry comment on the subject. Presumably, Remilia knows how to manage her employees' needs well, as in Strange and Bright Nature Deity Chapter 1, Remilia tells Sakuya Izayoi to let the maids relax, because if they get worked too hard, they'll get mental health issues. This chapter shows the maids conversing in an official work, where they're worried about an upcoming soy bean festival because those tend to put the mistress in a bad mood (and are difficult to clean up). Perfect Memento in Strict Sense states that employees of the Scarlet Devil Mansion are allowed to leave their jobs at any time, yet most end up staying. This also could imply that the employees of the Scarlet Devil Mansion are not bound by a devil's contract (not including Sakuya). 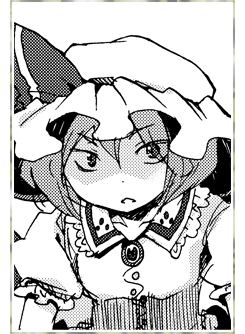 Following the events of Wild and Horned Hermit chapter 16, Remilia employs a number of hobgoblins as servants. Koakuma is a devil seen in the library of the Scarlet Devil Mansion during Embodiment of Scarlet Devil. The relationship between her and Remilia is unknown, her official profile says that she lives in the Scarlet Devil Mansion so it could be said that she is technically under the employment of Remilia indirectly. Tupai is Remilia's pet chupacabra. It is implied that she somehow mistook it for an actual tupai, but still called it the "Tupai" anyway. It is unknown if Remilia was involved in the discussions with Reimu Hakurei that led to the creation of the spell card rules. Certainly, Embodiment of Scarlet Devil was where Reimu first met the other residents of the Scarlet Devil Mansion, and also where she discovered that Remilia was the mistress. Reimu's actual dialogue with Remilia herself, however, does not necessarily indicate whether they knew each other prior to that meeting or not. At any rate, after their battle in Embodiment of Scarlet Devil, Remilia often drops by the Hakurei Shrine to hang out with Reimu. 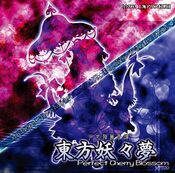 She is one of several youkai depicted when Reimu complains about youkai hanging around her shrine in Wild and Horned Hermit, and Reimu successfully argues in an early chapter of Strange and Bright Nature Deity that she should be allowed into a party at the Scarlet Devil Mansion because Remilia always comes to her shrine. Although Remilia is fond of Reimu, she still has a rivalry of sorts with the Shrine Maiden too and is more than happy to get into a duel with her, as shown in Imperishable Night and Remilia's storyline in Scarlet Weather Rhapsody. Like most characters, Remilia has been interviewed by Aya Shameimaru and is an involuntary source of news for her. Unlike other characters, however, Remilia seems to actually enjoy Aya's visits. Remilia plays along with Aya in Scarlet Weather Rhapsody pretending to be a monster in the Scarlet Devil Mansion, and afterwards requests that Aya tell her if or when it gets in the news. She asks if she could be allowed to write an editorial for Aya's newspaper in her victory quote to Aya. Aya remarks to Hong Meiling in her Touhou Hisoutensoku quote that she has a lot to thank the Scarlet Devil Mansion for due to its mass subscriptions to her news paper and providing lots of scoops. Remilia still gets annoyed when Aya just assumes she can come into the Scarlet Devil Mansion without being invited at the end of Silent Sinner in Blue, but lets her come along anyways. 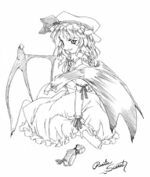 Yukari Yakumo used Remilia as part of her scheme to extract the residence tax and get revenge on the Lunarians in Silent Sinner in Blue. Patchouli reveals Remilia knew she was manipulated but didn't care, because she was bored. Remilia herself has an unexplained rivalry of sorts with Yukari, wanting to get to the Moon in her own way before Yukari could to surprise her. This rivalry might be due to the power struggle mentioned in Perfect Memento in Strict Sense's Vampire article, possibly starting with the Vampire Incident. The rivalry is mostly on Remilia's part, though Remilia has no objections to Yukari staying for the party at the end of Silent Sinner in Blue or assisting her with investigating in Scarlet Weather Rhapsody. Dialogue in Immaterial and Missing Power seems to imply they've already known each other before that game. It is possible they met at the Vampire Incident, and that Yukari was the one that signed "the contract" with Remilia. Remilia's different color palettes from Touhou Hisoutensoku. The 2nd one corresponds to her second color palette in SWR, while the 3rd one corresponds to her IaMP palette. Remilia's naming sense for her spell cards is famously bizarre. 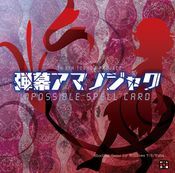 The names of the cards she uses in Embodiment of Scarlet Devil are all quite typical for a vampire, but many of the cards introduced from Immaterial and Missing Power onward had names that would make people go "how did she come up with this?". 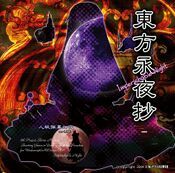 夜符「バッドレディスクランブル」 First Card "Bad Lady Scramble"
Due to "The Young Descendant of Tepes", the title of the prelude theme to the final boss stage of Embodiment of Scarlet Devil, she has been sometimes linked to Count Dracula's lineage. This is because Dracula's full name is Vlad Ţepeş Dracul. While Remilia herself asserts that she is a literal descendant of Ţepeş, ZUN claims that she is lying. Remilia is not only Sakuya Izayoi's master but the one who gave Sakuya her name, according to Perfect Memento in Strict Sense. Considering Sakuya's murky past and the unlikelihood of a human becoming a vampire's servant, the leading theory is that Sakuya was once a vampire hunter, and Remilia earned Sakuya's servitude by besting her in combat. According to Gensokyo's timeline, Remilia was born in the year 1503, making her, as well as Flandre Scarlet, two of very few characters whose birth dates are actually known. The name of her spell card "Red Magic" is very likely a reference to a MORI Hiroshi novel "All become F" (すべてがFになる, Subete ga F ni naru ~The Perfect Insider). In the novel, Redmagic is a name of an advanced OS developed by the genius Shiki Magata. One of Remilia's spell card is named after Gungnir, the spear of Odin described as having the ability to always hit its mark. It is quite coincidental that Remilia's appearance was in the 6th game of the Touhou Project. She is the Stage 6 boss, and the player will fight through 6 spell cards on that stage on any playable difficulty above Easy (Remilia has 5 spell cards total and Sakuya has 1 in her midboss appearance). When these numbers are all put together, it reads "666", best known as the "number of the beast". Remilia's theme starts the same as Beethoven's Piano Sonata no.8 Pathetique, "3rd Movement". 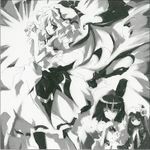 In Curiosities of Lotus Asia Chapter 4, Reimu Hakurei comments that Remilia should go back to her coffin. Remilia retorts that coffins are for the dead, indicating that she doesn't sleep in a coffin. In Imperishable Night's Scarlet Team Scenario, before battling Reimu, Remilia once again reminds her that she doesn't sleep in a coffin. Finally, in Oriental Sacred Place Chapter 15, released 7 years later, what's apparently the first canonical depiction of Remilia's bedroom is shown, and that she sleeps in a coffin (on a bed). 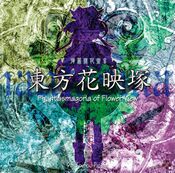 Her first 5 alternate pallets in Touhou Hisoutensoku resemble Flandre Scarlet, Patchouli Knowledge, Hong Meiling, Sakuya Izayoi and Koakuma, respectively. Despite her childish-girly appearance, she uses both a haughty "mistress" (～かしら？、～だわ) and a strong manly （～か？、～だ） speech patterns in her original Japanese lines. Unfortunately most of these nuances cannot be translated into English. There is a character from Yume 2kki named Oni Musume that bears a resemblance to her in terms of appearance (with the exception of pigtails or some sort of hair accessories in her hair) but is more close to Patchouli Knowledge in terms of location and behaviour. Since Remilia is a corruption of the name Emilia, a rather common name in France, and Scarlet is an alternative spelling to Scarlett, a common French surname, it's possible (but not certain) that Remilia is from France. Her sister's name, Flandre, is further evidence; Flandre is a French term for people from the province of Flanders, a region that, while today is in southern Belgium, was historically a part of France. In Perfect Memento in Strict Sense, Remilia was never directly stated to be the vampire behind "the Vampire Incident" (where a vampire first arrived and went on a rampage), so it was technically unconfirmed whether it was Remilia. Hieda no Akyuu states that any reference to the vampires in Gensokyo must be referencing the Scarlet family, which could mean the reader is supposed to assume the vampire in question is Remilia. Akyuu possibly speaks of the vampire in the Vampire Incident and the Scarlet Mist incident as one and the same in Reimu Hakurei's section due to the use of the word "that". The lack of a name may be a stylistic choice on Akyuu's part, as Remilia is simply referred to as "the vampire" in Sakuya Izayoi's article and "mistress" in Hong Meiling's footnotes. Other articles on species avoid stating any names as well. In addition to this, whenever Remilia is the subject of another character's conversation or inner monologue, she is referred to as "the vampire" the majority of the time (with the exception of Reimu Hakurei, who is officially stated to treat everyone the same and thus wouldn't give Remilia any special denomination, and Rinnosuke Morichika, who states in Chapter 26 of Curiosities of Lotus Asia that he tends to go on a lot about names, although he sometimes refers to Remilia as "the vampire" like in Chapter 18). 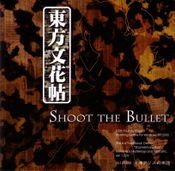 This is shown often in Cage in Lunatic Runagate from multiple characters' perspectives, such as Eirin Yagokoro, Yukari Yakumo, Yuyuko Saigyouji, Youmu Konpaku, and Fujiwara no Mokou's points of view. 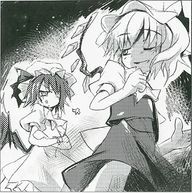 In fact, only Reimu's perspective and what is either neutral narration or Remilia's perspective in the last chapter refers to her as "Remilia" despite "the vampire" coming up many times. The tendency to refer to Remilia as "the vampire" without bothering with her name shows up elsewhere too, such as in Bohemian Archive in Japanese Red's article on the Scarlet Devil Mansion. As various characters are able to refer to and think of Remilia as "the vampire" without worry of others mistaking them talking about any other vampire. This may also be another implication that she was the vampire in the vampire incident. Beyond Perfect Memento in Strict Sense, possible evidence of the Vampire Incident being related to Remilia is the possibility of the Scarlet Devil Mansion receiving outside world humans for food from the contract. The Scarlet Devil Mansion almost definitely does have humans for food as Flandre Scarlet makes it very explicit in Embodiment of Scarlet Devil. However, this source of humans is presumably not from Gensokyo's native population, as Yukari Yakumo specifically says those humans are not for eating under the contract in Cage in Lunatic Runagate (but doesn't tie it to the vampires). However, nothing in particular directly states that they get the humans from the village in the contract. Remilia does show an interest in how Yukari brings in humans from the outside world in her Touhou Hisoutensoku victory quote, but again, this is still not directly explicit. Many many years later, it was finally confirmed in Strange Creators of Outer World 2 that Remilia was indeed that vampire in the Vampire Incident. The final boss. She's been the mistress for about 500 years. She doesn't tell you directly and only hint during the game, but she is a vampire. She blanketed Gensokyo with a magic mist in order to cut off the sunlight. Although she has been alive for 500 years, her personality is that of a selfish child. She is respected by most youkai, but her charisma doesn't stem from her personality; rather, it comes from the fear that they have for her kind. She has one younger sister; nothing else is known about her family. She is a light eater. In other words, she can drink only a little blood at a time and must leave the rest behind, so the humans off of whom she feeds become a bit anemic, but usually stay alive. Due to that fact, she always fails to increase the number of her kind. She often spills more blood than she consumes. The spilled blood dyes her dress a deep scarlet, which is what gives rise to her title, the "Scarlet Devil". She swears that she is a descendant of Tepes, but nobody is certain whether she is truly related to the Vlad "Dracula" Tepes. Well, in fact, she is not. Total of ten card attacks. Master of the Scarlet Devil Mansion. She looks young, but she's actually a vampire who's over 500 years old. Weak against sunlight, she has to take a parasol if she wants to go out in the daytime. Her personality is somewhat childish, and she's got maids who are basically at her beck and call, so she can be as egotistical as she wants. She's immensely powerful, so she can really kick up a fuss. Faster than the eye can follow, strong enough to crush boulders, powerful enough to manipulate demons, she's so strong it's almost not fair, so she doesn't care much for subtle technique. She may be weak against sunlight, but she has a pretty strong constitution, so as long as some bit of her still remains, say, a little bat, she can regenerate any time. She's dreadful to have as an enemy, but she's not exactly the sort of person you'd want as a friend, either. A vampire who resides in the Scarlet Devil Mansion. She can manipulate fate. She has apparently lived for over 500 years. Considering how long she has lived, she acts rather childishly. Creatures of her kind forfeit their growth and maturity in exchange for eternal life. In other words, she can live forever because she never grows up. It goes without saying that she is weak against sunlight, can't cross flowing water, hates garlic, and despises sardine heads. Crosses have no effect on her. It puzzles her to hear that her kind are supposed to be weak against such a thing. She uses bats and arrows as her weapons. She can spawn an unlimited number of bats from herself. She teams up with Sakuya this time. Normal speed only applies when she's used as a solo character. Her familiar remains in place once set, and continues to attack from that position. Used properly, it's quite effective against both bosses and their weakling subordinates. Good for those who believe that memorization of the enemies' appearance position is the basis of shooting games. In the middle of a lake in Gensokyo, there is a scarlet mansion. She is the mistress of that mansion. She is very childish even though she has been alive for more than 500 years. Devils, including vampires, are hated with a passion by both humans and youkai, because their kind tend to be self-centered and selfish. Remilia indeed is no exception. Type-B blood tastes the most delicious to her. Master of the "Scarlet Devil Mansion", a European-style building located by the shore of a lake. She looks like a young girl, but in fact she's a vampire who has lived more than 500 years. Her personality and behavior are as childlike as her appearance, though. She takes pride in her tremendous physical abilities as a vampire, and additionally she has the ability to manipulate fate. It appears that any person nearby her will have an unfortunate fate, even if Remilia herself is unaware of them. Personality: Acts superior and is superior. Yet, a child who hasn't grown out of being childish. 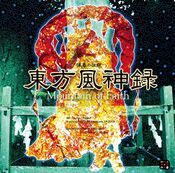 ↑ Symposium of Post-Mysticism: Afterword by Hieda no Akyu. "the vampires that came from the West"